With the introduction of new technology, changes in the economy and adjusting employer needs; the role of the recruiter has changed significantly throughout the years. Until the 1900’s all jobs were advertised in newspapers and the closest thing to a candidate database was a Rolodex and growing pile of business cards. Fast forward a few decades and everything has been digitalised, making the process quicker and more efficient than ever before. So just how much have things changed in the world of recruitment? 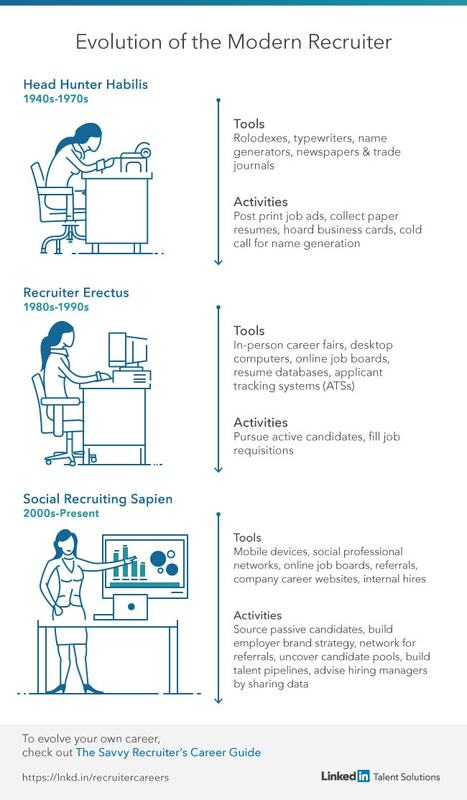 LinkedIn have investigated the evolution of the modern recruiter and how the role has changed since World War II. With limited resources available, recruiters had quite a job on their hands to track down the best person for the job and pretty much had to behave like a private detective in order to hunt them down. These were the days before computers and the internet, so recruiters relied on personal connections, hefty phone books and relying on their newspaper ads reaching the right people! The only tools available to a recruiter were rolodexes, typewriters, name generators, newspaper and trade journals – Sounds like a lot of paperwork and filing! In order to fill roles their responsibilities involved posting job ads, collecting paper resumes, hoarding business cards and cold calling in order to get names of people who could be suitable. Hoorah the computer was born! Luckily tools were slightly more advanced by this stage, with the introduction of not only the desktop computers, but also….the internet! No more endless stacks of resumes and business cards covering every inch of the office. Technology advancements meant that online job boards, resume databases and applicant tracking systems made the recruitment process much more efficient and broadened the candidate pool significantly. The role of the recruiter was now to pursue active candidates and fill job vacancies. Paper resumes and phonebooks are a thing of the past! Everything is done online now, from the initial sourcing of candidates, to even the interview on some occasions! New technology means that the whole recruitment process has been digitalised, with large focus on social media, company career sites, mobile apps and online job boards. Employee referrals are also greatly valued and passive candidates are highly sought after.